The Marketplace open enrollment period is the regular time each year when people can newly enroll in a qualified health plan or change to a different plan through the Marketplace. But certain events that occur during the year can trigger a special enrollment period (SEP), when a person may be able to newly enroll in a Marketplace plan or change to a different plan. 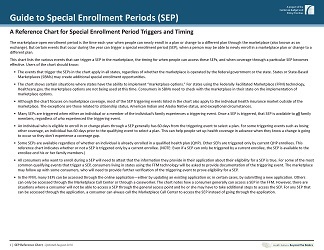 This SEP Reference Chart is a tool for those who are helping people enroll in health coverage through a special enrollment period. It focuses on the circumstances that trigger a SEP in the Marketplace, who can trigger a SEP, and the effective date of coverage once a health plan is selected.